Sharks have the healthiest teeth in all of the living creatures including Human beings who maintain the best set of teeth. Shark teeth which are one of the most sharp and fierce teeth in the entire animal kingdom have a special ability to be completely protected from Dental Caries. 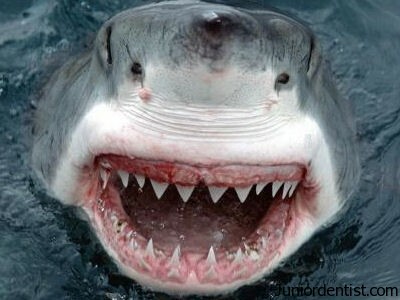 shark shave a very cariogenic diet of Fish, dead animals, rotten flesh and any thing they can find. But still they have these perfectly healthy Pearly white Caries free teeth, and how is this possible ?? the Answer is – Sharks have the ability to produce Flouride and protect their teeth with a concentration of 100% fluoride which covers their teeth and also is a main component of their teeth. And adding to this super Caries resistant property Sharks even have the ability to Shed and Replace their teeth in regular intervals. If the same was seen in Humans with such high fluoride content in teeth, Dentists would never have existed due to the perfect set of teeth everyone would have all through their lives. Humans have Hydroxyapetite in our teeth which are not anti cariogenic compared to fluoride. Fluoride is used in toothpaste and mouth washes for the same reason. Wow, that is amazing! Yet another reason Sharks are the best creature in the animial kingdom.